Two former members of the Augustana art department faculty, Palmer Eide and Ogden Dalrymple, were key figures in the history of the Hovland Center for Liturgical Arts. Palmer Eide served as a member of the Augustana College faculty from 1931 to 1971, advancing to become full professor and chairman of the Department of Art during his career. He created several pieces for the Chapel of Reconciliation. A Special Supplement to Faculty Development at Augustana (September, 1992) notes that "Eide, a deeply spiritual man, believed that works of art are supports for contemplation and refreshment for the spirit. He taught that art is a representation of significant things that cannot be seen except by the intellect." According to Bob Aldern, Eide's art was "dedicated to the concept that less is more. Clarity and simplicity are important; Eide had the instinctive ability to know what to leave out of his sculpture. Essential to his art was communciaiton. Eide never surrendered to total abstraction." Ogden Dalrymple joined the art department in 1946, after having earned degrees at the University of Michigan and Yale University and serving in the U.S. Army during World War II. He taught courses on drawing, design, and sculpture even after his retirement in 1973, all the while producing a great many commissioned pieces throughout the Midwest until his death in 1991. 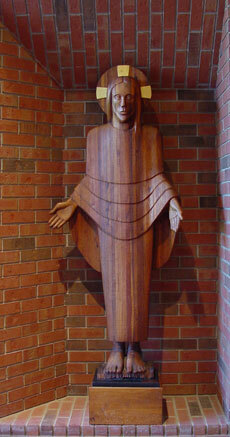 A number of his liturgical works can be found on campus, including the Chapel of Reconciliation. In 1949, Palmer Eide of the Art Department was asked by recent graduates of the Augustana Academy in Canton, South Dakota to create a fresco suitable for the school's new library. Not wishing to work alone and needing help, he shared the commission with his close friend and colleague, Ogden Dalrymple. Taking their cue from the door panel Dalrymple was then carving for First Congregational Church in Sioux Falls, the two artists set out to transfer that bas-relief into painted form. 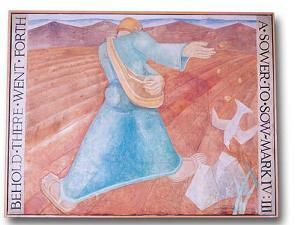 The resulting eight-foot wide by six-foot high fresco, titled "The Sower," (based on Mark 4:1-20), was installed at the Academy library in the fall of 1949. For forty years the fresco hung on the library wall, literally forgotten, until Joel Eide '53, director of the art gallery at the Northern Arizona University in Flagstaff, recalled that his uncle had created the piece. His desire was that it should be preserved if it still existed. Keystone Treatment Center in Canton had taken over some of the buildings at the Academy after it closed in 1971. Joel Eide communicated with the Center's director to begin tracking down the fresco. In the old library on the north wall was what appeared to be a raised wall hanging. Investigation with paint remover revealed the missing fresco. It had been painted over with a white paint and sand mixture and was supposedly used as a film screen. With Keystone's permission, Joel and Diana Eide and College benefactors Howard and Eunice Hovland carefully worked to remove the fresco from the wall to which it was bolted. Aside from a few cracks, areas of layer separation, and chipped edges, the fresco appeared to be in fairly good condition. Under the direction of Dr. Arlen Viste, Chair of the Natural Science Division at Augustana, the paint removal began. Robert J. Aldern agreed to supervise the restoration of the piece by a number of Academy volunteers. The paint coating was dissolved and cleaned down to the original fresco surface. Since the true fresco was painted on wet plaster and the surface was now dry, Aldern restored selected areas with an over-painting of oil on the dry plaster to simulate the original fresco in stroke, color, and medium. Upon completion, "The Sower" by Palmer Eide and Odgen Dalrymple was permanently hung in the narthex of the Chapel of Reconciliation and dedicated on Sunday, December 5, 1999. The baptismal font and dove in the Chapel of Reconciliation were designed and built by Palmer Eide in 1980. Made of red oak with corners inlaid in walnut, they complement the pulpit and altar that were also created by Eide. Eide also made a white iron processional cross for the Chapel. The statue of the "Glorified and Risen Christ " by Palmer Eide is located in the narthex of the Chapel of Reconciliation. Made of laminated walnut and placed in 1980, it was given in memory of Esther Hokenstad Eide (1906 - 1978).